The ‘Scaling Guide’ is one of the most important tools for getting the most out of your time at the gym. The key is to remember that the goal isn’t to get the fastest time, or the most rounds. The key is to use the ‘best’ progressions to land you right smack dab in the middle of the guide! 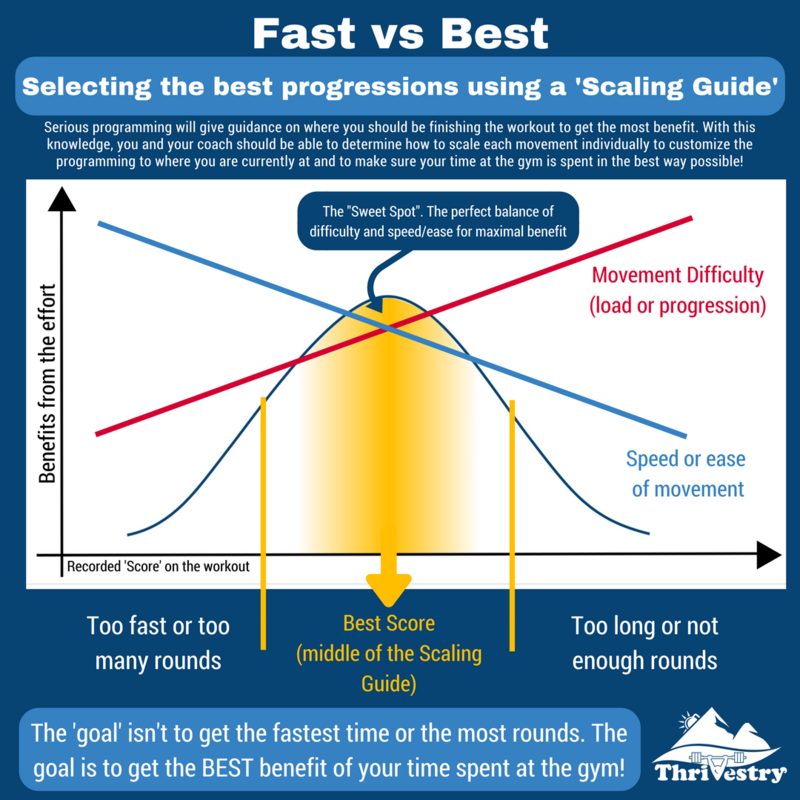 Before you start the workout, pick the loads and progressions for each movement that you think you can manage to end up in the middle of the scaling guide. Talk to your coach if you aren’t sure, and make sure you have a ‘back up plan’ if after the first few minutes you start lagging behind the target (this is why we usually post ‘minutes per round’ on most workouts). It is encouraged to start the workout with loads and progressions (aka ‘scaling’) that may be a bit of a stretch if performed for the entire workout. When you are ‘fresh’, you should be able to maintain good form and intensity at these more difficult loads/progressions. If things are going well, keep going! If you start to slow down, or you can’t maintain great form within the time guide, be ready to scale back the movement to a lighter weight to maintain safety while still moving with intensity. One round of ‘Athletic’ or ‘Performance’ is better in the long run than a really fast workout where every round is scaled! The biggest mistake we see is folks getting too caught up in their score at the end of the workout. The real ‘winners’ are the people who select the right movements/progressions that are going to get them the BEST results. If you are a beginner, this means that you need to put your ego in check and do the movements that are going to get you into the middle of (or a tiny bit better than) the middle of the scaling guide. If you crush the scaling guide, it means that you might have made it ‘too easy’. If you struggled to finish within the scaling guide, it means that maybe you went too hard. Side note: Many folks will ‘err on the side of caution’ and do things they are comfortable with, even if they are capable of more. Not only will this slow total progress, it can also change the stimulus of the workout or even put you at risk for injury! For example, if you scale back the load of a squat, or do knee push ups instead of challenging ring push ups, you may end up doing TOO MANY rounds of an AMRAP. If you are doing a ‘for time’ workout, you may end up back at another movement without an adequate gap for certain muscles to recover. Doing too many reps because you did 2 more rounds than the scaling guide or doing sets of repetitive movements too close together (because the movement(s) in-between were too ‘easy’) will cause more soreness and predispose you to tweaks and injuries. If you are more experienced, you may find yourself crushing, or even beating, the scaling guide, even at the ‘Athletic’ or ‘Performance’ loads/progressions. This is a sign that you need to start thinking about doing heavier loads or more advanced progressions. Look at each movement individually and be honest with yourself about what progression is going to be the right balance between challenge and speed. When in doubt, ask your coach about what you should do. Generally, they’ll know where you should be at, and they’ll make sure you aren’t ‘sandbagging’ or biting off more than you can chew. If you do end up outside of the scaling guide, learn from your experience and make better decisions for next time. You aren’t “wrong” when you end up beating the scaling guide or going a minute or two over. It just means that you probably didn’t pick the BEST movement for the workout today (or maybe you didn’t have a good ‘back up plan’ when things went off the rails). We must remember that we are training for the long game. Going too heavy or too advanced is just as detrimental to your progress as going too light or too easy. You are investing an hour (or more) of your life at the gym today. Let’s make sure you are getting the most out of it by picking the BEST movements to get the most return on your investment!